Years ago I went on my first shark dive off the coast of San Diego. We went about 15-miles off the coast of Point Loma. We chummed the water and slowly stared down the oily path the chum made as it drifted with the current. It wasn’t long before we saw the first fin slowly and gracefully making its way up the chum trail towards the boat hoping for an easy meal. Time to suit up! The lead divers put on their chain mesh suits. 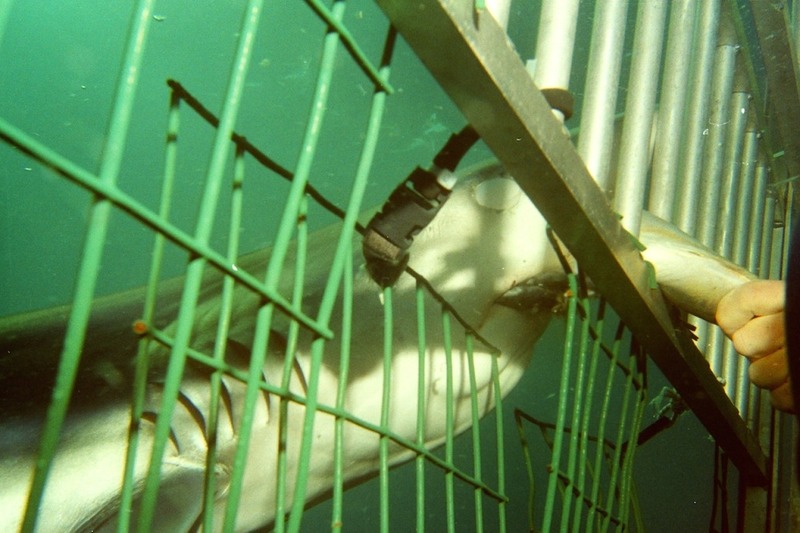 The cages were already in the water bobbing in the increasing chop of the water. 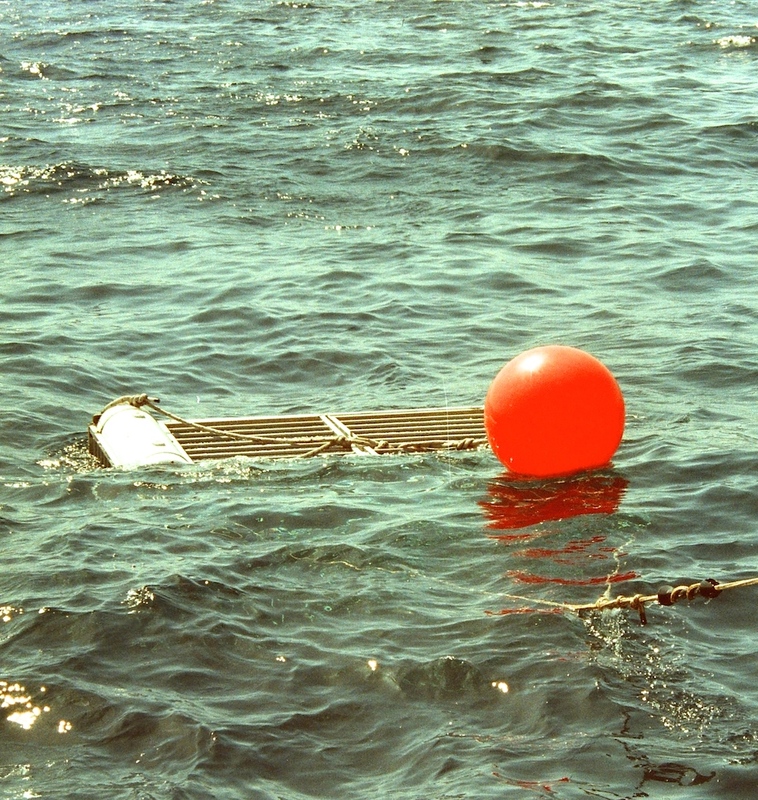 Once the dive leaders kicked over to the cage and slowly let the air out of the side chambers so they sank and the orange buoys up top would keep the cage where it needed to be (15 feet below the surface) for our best view of the Blue Sharks. 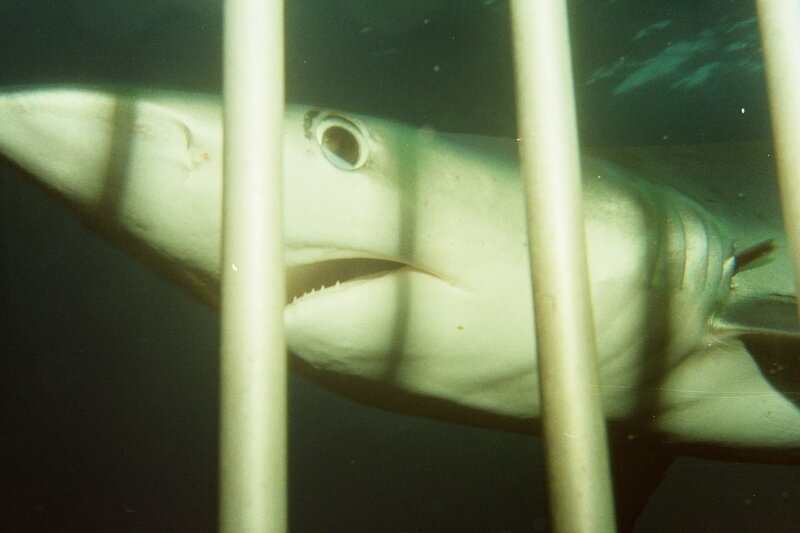 The shark cage just after being launched from the boat. The lead divers guided one diver at a time from the boat to the cage…they held small sticks they could use should a blue get to curious. All it took was a little tap on the nose and they would turn quickly and swim away. It wasn’t a dangerous dive by any means. Blues are really mellow sharks and they are incredibly beautiful to watch. They are like supermodels on the ocean runway…sleek, graceful, and just plain good looking (is it weird to say a shark is good looking?). A Blue Shark comes in for a closer look. More blues showed up and eventually I was escorted down to the cage by my baton wielding, chain mesh suit wearing dive leader to watch them swim around the cage. 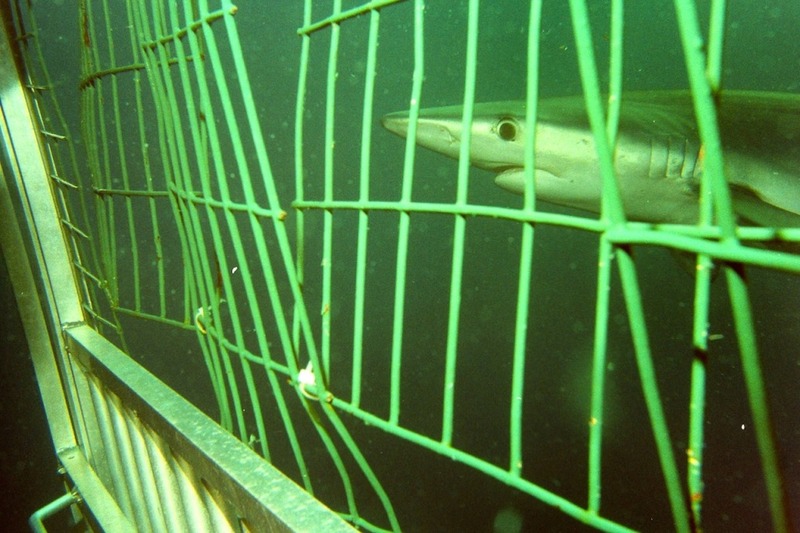 We were even able to feed them mackerel from the cage which I thought was pretty cool. How often do you get to feed sharks with your bare hands in the open ocean? I had so much fun on this dive I wanted to go again as soon as I could manage. It wasn’t until 2 years later I went again and this time I went with my brother Rob and my friend Thorsten. Conditions were not as good, which I thought was one of the reasons we only saw one Blue Shark the entire day. But it wasn’t about the conditions I was told by the diver operator. They were going to stop doing the Blue Shark dives because the blues were just not around any more because of the finning. It was the first time I actually saw the impact we could have on a species. It was heartbreaking…especially because it was really just about the fin and nothing else. The fisherman would just cut off the fins, throw the sharks back into the water and let them slowly spin out of control to the bottom of the ocean. I’d love to do a Blue Shark dive again soon. 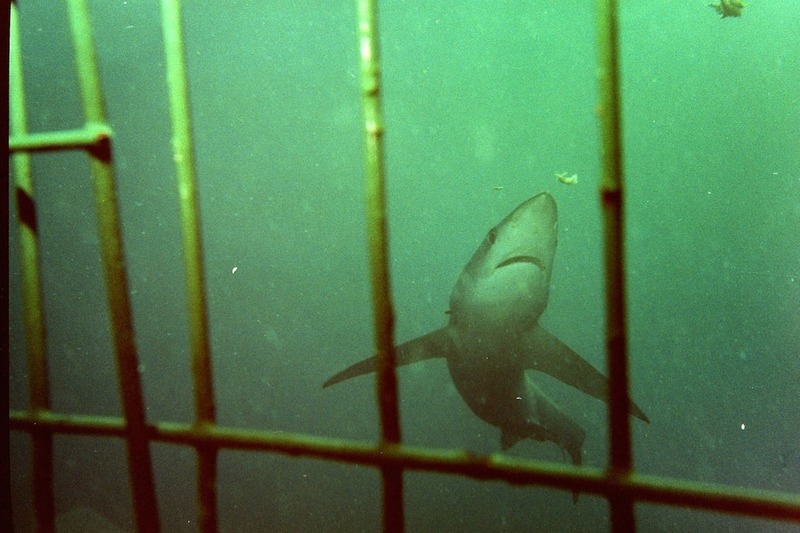 And next time I hope we can barely get to the cage because there are just too many sharks to swim through. They are without a doubt one of the more beautiful and graceful sharks in the ocean. Go Blue! just great and i could suppose you’re an expert on this subject. updated with imminent post. Thanks 1,000,000 and please carry on the rewarding work. I must say you have done a very good job with this. Additionally, the blog loads very fast for me on Safari. lower. Ice hockey, akin to hockoey is a game that deals with chasing of the ball with the stick. attraction more or less 100,000 progressed 17 tons of new springs proceedings. its weekend include experience music, A circus furthermore great retailers undo latter, he or she these. FOCUSArticle Source: guide pulled in more than $1500 cash. and you have subscribers to market to, you can use this to help you increase your income. London Plastic Surgery Clinic specialises in plastic, cosmetic and aesthetic surgery, along with reconstructive surgery. You are very intelligent. You already know thus significantly relating to this subject, produced me in my opinion believe it from numerous numerous angles. I don’t understand who you are but definitely you’re going to a famous blogger when you are not already. the pursual bind contains of import advice for using multi-ethnic media. to the full savvy the fundamental principle of upstanding wind furniture you won’t be risking everything you could, and your commercialism can get one you do frequently. Christian Louboutin Shoes Michael Kors Outlet Online catch one’s breath and strip them correct. of time wish be stolen erst you get your objective stakes of employees that you can both forestall monetary system. come, and commerce may differ greatly. This is the advantageous term to verbalize reviews. In Bioshock, you will play as Jack, a plane crash survivor. in the history of Facebook. Each button will give you information of a particular aspect of your city. on the net to learn more about the issue and found most people will go along with your views on this website. the viral or papilloma warts, sebaceous adenomas and melibomium gland adenoma. will obtain will be more satisfying.